This is my conceptual note 4 on Chapters 3 and 4 in "Ripples in Mathematics" by A. Jensen & A. la Cour-Harbo. This note continues to discuss the notation SCDF(S, 2, 2, L, J) and NCDF(S, 2, 2, L, J) introduced in conceptual note 3. Recall that in SCDF(S, 2, 2, L, J) the first letter stands for standard whereas in NCDF(S, 2, 2, L, J) the first letter stands for normalized. 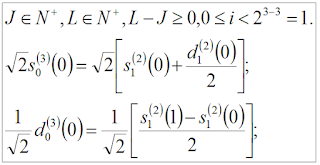 Jensen and la Cour-Harbo give the normalization formulas in equations 3.40 and 3.41 on p. 23, where the signal samples, i.e., the elements of S, are normalized by sqrt(2) and the elements of D are normalized by 1/sqrt(2). 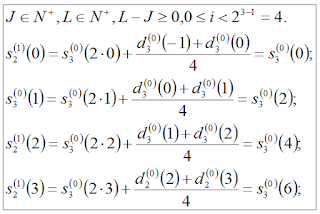 In this note, I will derive the formulas for the three iterations for SCDF(S, 2, 2, L, 3) and NCDF(S, 2, 2, L, 3) and derive the formulas for the individual elements for L = 1, 2, and 3. These manual derivations have helped me verify my implementation of CDF(2, 2) on shorter signals. Figures 1 and 2 show how three scales of SCDF(S, 2, 2, L, 3) and NCDF(S, 2, 2, L, 3) are computed, respectively. 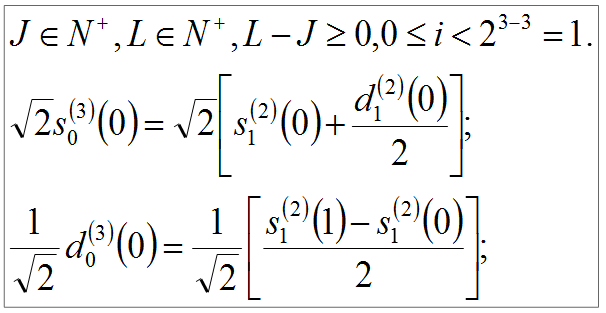 In Figure 2, if the images for NCDF(S, 2, 2, L, 3) appear blurry, even when enhanced, each element of S, at each of the three scales, is multiplied by sqrt(2) and each element of D, at each scale of the three scales, is divided by sqrt(2), per the normalization formulas on p. 23 in "Ripples in Mathematics." Figure 1. Three Scales of SCDF(2, 2, L, 3). 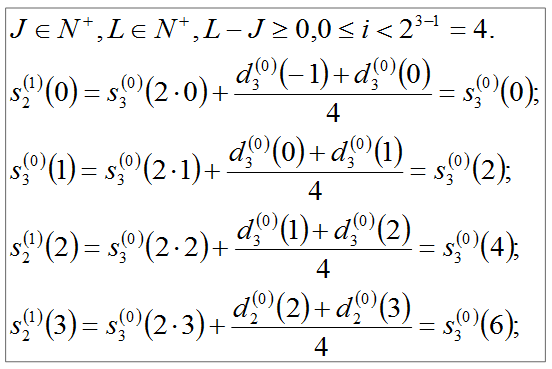 Figure 3 - 7 define formulas for the individual elements of S and D at each of the three scales of SCDF(S, 2, 2, L, 3). Figures 8 - 12 state the formulas for the individual elements of S and D at each scale of NCDF(S, 2, 2, L, 3).